One of the greatest things about the city of Madison is the social atmosphere that surrounds it. This social lifestyle of Madison is especially prevelant at night time. I have a few activities that, in my opinion, are “must-do’s” if you are a visiting Madison. The first of which is going to the terrace on a Wednesday night. The terrace is one of the most beautiful parts of Madison. 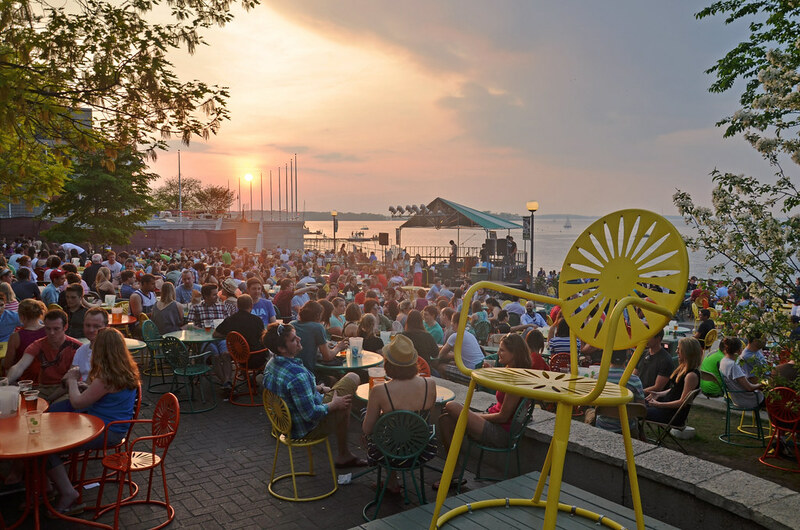 It’s right on Lake Mendota and has food, pretty views, and music. Wednesday night at the terrace is known as “open mic night”. Whoever wants to come on stage and perform in front of everyone is welcome. Some performances are incredibly funny because of how bad they are, and some people that perform are very talented with their singing or whatever they choose to do. Either way, everyone is incredibly entertained. Open mic night, a brat and a lemonade, and a view of the lake is my idea of a perfect Wednesday night. Aside from the terrace, there are plenty of places to eat that I am convinced are made for night time snacks. One that automatically comes to mind is Insomnia Cookies on State Street. This place sells, and can deliver, delicious cookies. If you’re ever craving a yummy cookie, you can get a box delivered to your location and you don’t have to move. The second place that comes to mind is Ian’s pizza. The reputation of Ian’s speaks for itself. They have a type of pizza for everybody, and incredibly high quality pizza.